The next installment in the Assassin’s Creed series was leaked earlier this week by Gamestop and has since been confirmed by Ubisoft. Assassin's Creed Brotherhood will continue the AC story later this year. Ubisoft has not released any official details at this point, but is hinting at an information dump on the title coming within the next week or so. There is some information that can be drawn from the placeholder art that was originally released by Gamestop. Most importantly, it appears as though Assassin's Creed: Brotherhood will focus on a multiplayer aspect contrary to the single player adventure that encompassed the first two games. 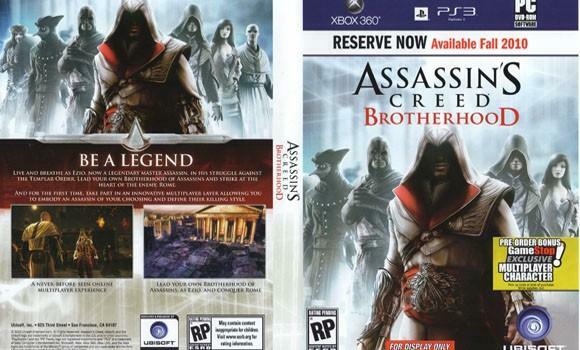 The box art claims that you will “lead your own brotherhood of assassins”. The game is scheduled for release on XBox 360, PlayStation 3, and PC and should be released by the end of this year.